Sensationally, Cardinal George Pell was charged with child sexual abuse during 2017. Dr Martin Hirst's timely June warning about the risks they ran by commenting on these charges was very well received by IA fans, receiving more than 13,100 unique reads. Now Victorian Police have issued a summons and formal charges against Cardinal George Pell, the media – including social media users – must be very careful what they say. Political editor Dr Martin Hirst has some advice. IF YOU HAVE been following the Pell case and are a social media user, chances are you will have seen tweets, Facebook posts, Reddit threads and Instagram memes taking a position – or at least offering an opinion – as to the Cardinal’s guilt or innocence. This was all a harmless game while ever Pell was walled up in Vatican City and out of harm’s way, so to speak. In the absence of formal charges or court proceedings against him (civil or criminal), such commentary was legally fine from a sub judice point of view, even though it may or may not have been defamatory. All the speculation must now come to a halt until the completion of the legal process against Pell, including any time granted for him (or the Crown) to lodge an appeal at the conclusion of the first trial (probably in the Supreme Court of Victoria). In legal terms, as of 29 June 2017 we are in a period known in obscure legal terms as "sub judice". It is likely to extend for several years from now. The trial (if it goes ahead) will be long and bitterly contested. Sub judice is a Latin term that can be translated simply as "under judgment" or if the visual image helps you to remember "under a judge". That is while ever justice is “sitting” on the case (sitting in judgment) there are restrictions on what can be reported. The law of sub judice is in place to ensure that defendants get a fair trial and, no matter what you personally think of Cardinal Pell, he still has the right to an honest, open and full trial in the public eye. Sub judice actually also protects other parties to the trial as well, particularly witnesses. In this case that is very important. The bare facts of the case and a fair and accurate reporting of proceedings are allowed during sub judice periods. It is obvious that sub judice applies to all news reporting and commentary of a court case and there are very strict rules around what can and cannot be reported and also around the time frames in which certain aspects of the trial can be reported. What it is important for IA readers to understand is that sub judice applies to everyone. Members of the public are bound by this rule just as much as journalists and news outlets. If you are on social media then having some familiarity with sub judice is important as anything you post on Twitter, Facebook, Instagram, or in the comments thread on a site like IA (or any other news outlet) is caught under the rule. when in doubt don’t send the tweet or publish the Facebook update. Unless you’ve been on Mars for the last five years, you will know that the issue of historic child sexual abuse in Australian institutions is huge. Cardinal Pell is the most senior Catholic figure (former Archbishop of Australia) to come before the courts on the issue. 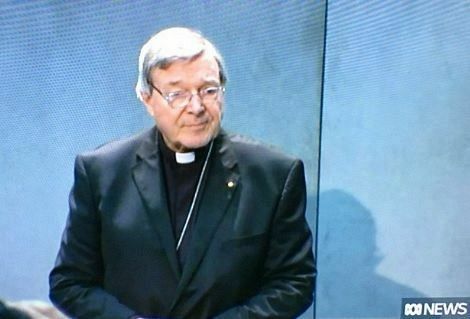 Pell maintains his innocence and has pledged to return to Australia, face his accusers and fight the charges. He has every right to do that and the sub judice rule is there to protect this right. However, this is more than just another trial of a priest accused of sexual abuse. Pell is very high profile. He has been influential in the Catholic church for decades and is currently in a senior Vatican role. Pell is a friend and confidant of politicians, including the Mad Monk. Pell also has many high-profile defenders, besides Tony Abbott. Pell’s chief supporters are to be found in the ranks of the NewsCorpse press. Already, within the first 24 hours of the Pell charges story breaking, Miranda Devine was already madly tweeting (and deleting) in Pell’s defence. Devine’s tweets may already be in sub judice contempt, so we are not going to reproduce them here. She has already deleted at least one pro-Pell tweet that had the weird tagline #HuntingCatholics. If you really must see it, jump on Twitter, plenty of people have posted screenshots that will be in circulation for some time. But, just in case, don’t retweet it. Alongside Devine, who has been vigorously defending Pell from allegations of abuse and cover ups, the other high profile NewsCorpse voices in his corner include Bolt, Sheridan and Kelly. They have written extensively about how the case against Pell is no more than a witch-hunt. Even reproducing those stories now might be construed as sub judice contempt. It is not even beyond the realm of possibility that some historical reporting of the allegations against Pell may be taken down, at least until completion of the matter (after conclusion of trial, or at end of appeal process if it is initiated). The other consideration to bear in mind is that, Pell’s supporters believe he has done nothing wrong and his legal team will be doing everything humanly possible to get him found not guilty, acquitted or the trial thrown out. The easiest way for the process to be aborted is if the court is forced to declare a mistrial because of prejudicial reporting or prejudicial comments in social media poisoning the well for the selection of jurors, or because of some other problem with the case as a result of sub judice contempt. This is not the outcome anyone wants really. If Pell deserves a fair trial, then so to do those who will come forward as his accusers. A sub judice contempt can damage the prosecution case as well as that of the defence. So here are a few simple rules to bear in mind over the next few months while this trial plays out. Sub Judice Contempt - when a summons or arrest for warrant has been issued. 3/.. if there is a suppression order in place there will be further restrictions on what can be reported #Pell and lawyers want suppression. /7 might be presented to court to claim/force mistrial. All of us need to be careful. 8/.. be construed as interfering with the trial, influencing jury, tampering with witness or bringing court into disrepute. 9: Please be careful what you post in comments on the Pell case. We will be monitoring all comments and if we think something is in breach of the sub judice rules it will be taken down. 10: Once the trial is under way, be careful what you post to social media in regards to the media coverage too. You could make a contemptuous statement indirectly by commenting on the media coverage. Remember, contempt does not have to be deliberate, it only has to be published (and for journalists that means if you are given information that is in contempt, you could be in trouble because the court will assume you intended to publish it, even if you haven’t yet). When a trial is under way, the sub judice rule does not prevent fair and accurate reporting of the trial. However, some strict rules do apply. Only material presented in open court – in front of the jury or trial judge(s) – can be reported. Suppression orders that have been imposed prior to the trial are still in place. Details of any confession cannot be revealed until read into the court transcript. Any commentary that scandalises the court (insults the judge or court officers) will be held in contempt. Do not speculate about the innocence or guilt of the accused. Do not approach witnesses or jury members for comment. IA will be following this case very closely and we will be sticking to the rules. You can follow political editor Doc Martin on Twitter @ethicalmartini. Understand more. Subscribe to IA today for just $5.